Elk, the other red meat. There are very few things that Sarah Palin and I would ever agree upon, but venison being a superior meat to America’s slaughterhouse beef is one on which we definitely would see eye-to-eye. We would probably even swap a few recipes and the only debate we would have, about the meat that is, would be who makes the best chili. My chocolate cherry chili would win, hands down! But I’ll leave that blog for another day. This one is about our Elk roast dinner last night with our good friend Mary. The small party was supposed to include another friend, and artist, Zannah Noe, who’s work is displayed throughout our apartment. Unfortunately, we received a text from her at the last minute letting us know she was under the weather and wouldn’t be making it. Feel better Zannah! We received the elk roast from Steve’s father, Karl, who lives to hunt and fish. Most people would be turned off by the smell and taste of wild meat, and I must admit that I was once that way. But over the years of substituting venison for beef, I can honestly say that I prefer the musky taste of it over the flavorless greasy beef that comes from the grocery store. It’s also nice to know exactly where the animal I’m consuming came from; what type of food it grazed on; and that it’s death was more humane than the conveyer belts of cows that line up to be slaughtered, day and night. 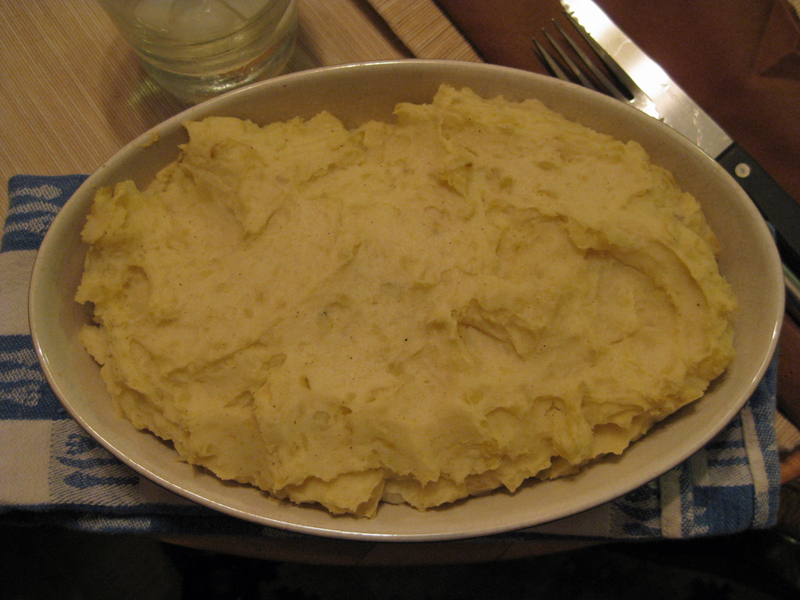 Is there anything more comforting than a big bowl of mashed potatoes? The recipe for the roast came from Cook’s Illustrated, Simple Pot Roast, which you can only get online by being a member, but I’ll give you the run-down at the bottom of the post—just don’t tell Chris Kimball. The moment I unwrapped the elk roast I knew it was going to be a great meal. The meat was lean and firm, and there was no fat or sinew to cut away. The only prep work necessary was to tie the meat together and pat it dry with paper towels before placing it in a hot stock pot with vegetable oil. As decadent as ice cream with a little less guilt. With the pot roast we serve mashed potatoes and bleu cheese popovers, a variation of the popovers that Steve has become very fond of. Unfortunately they didn’t rise all that well, probably due to a reduction in the oven temperature, but were still quite tasty. 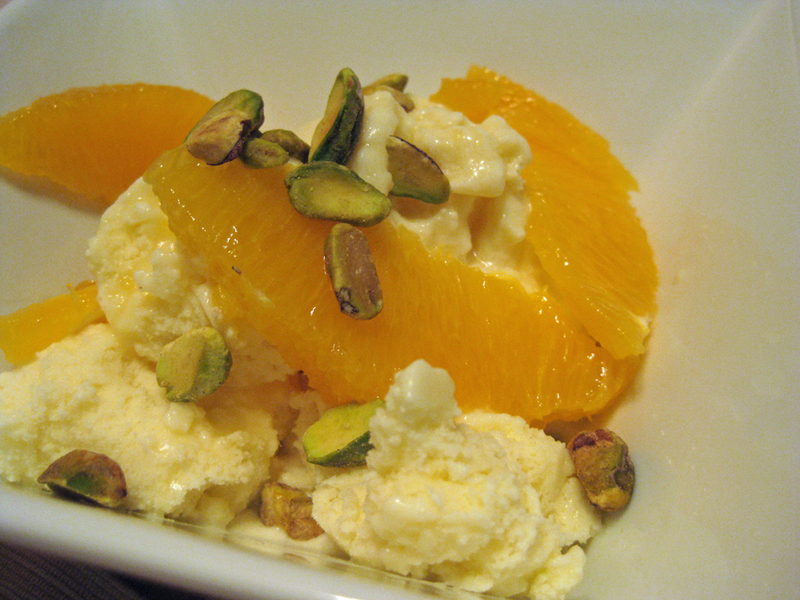 For desert, we served a cardamom and cinnamon scented frozen yogurt, that was topped with orange segments and pistachios. It had a bit of middle eastern flare to it, but the oranges are so abundant right now and we have a lot of cardamom and cinnamon in our pantry, I thought it would be a great use for them. It was also a little lighter then say, an American cherry pie, or even traditional vanilla ice cream. The conversation was the best thing about the dinner. We really enjoyed getting to know Mary a little better and can’t wait to go over to her house and help her in her garden. We’re hoping to have more dinner parties in the future; giving our friends the chance to try venison and some wonderful grass-fed beef. Heat the oil in a large, heavy bottomed stockpot until oil is shimmering. Place the roast in pot and sear until a nice dark brown develops on all four side, 8-10 minutes. Reduce the heat if there is too much smoke and add more oil if meat is very lean and the bottom of the pan dries out. Transfer the roast to a clean plate and add the onions, diced carrots, celery, and mushrooms. Sautee until the vegetables start to brown, stirring occasionally, 8-10 minutes. Add the garlic, cooking until fragrant, about 30 seconds. Add the broth and water, scraping up the bottom of the pan. Return the roast to the pan and any juices that have accumulated. Turn the temperature up and bring to a boil. Add the thyme, cover the top with foil and then place the lid on top. Place the pot in the oven and cook for 3 ½ – 4 hours. Every 30 minutes turn the roast over on each side. After about 2 ½ hours add the sliced carrots and the turnips. Making sure that the vegetables are submerged in the cooking liquid. When the roast is tender remove the pot from the oven and remove the roast from the pot. Tent the roast with foil and remove the carrot slices and turnips. If a lot of fat has accumulated, skim from the top. Then place the pot on the stove and reduce the cooking liquid to about 1 ½ cups. Add the red wine and reduce a few more minutes. Cut the string from the roast and slice it into 1-inch pieces. Arrange the roast and the vegetables on a warmed serving platter. Serve with horseradish cream and sauce. Mix all together and serve with roast elk. Heat the milk in a pan with the cinnamon stick and cardamom pods, until just barely warm. Place a lid on the pan and let seep for 30 minutes. Discard cinnamon and cardamom pods. Add half the sugar, heat until steam barely rises, stirring to dissolve the sugar. Meanwhile beat the egg yolks and other half of sugar with a pinch of salt until light yellow and very thick. Slowly add a little of the warmed milk, whisking constantly so as not to cook the eggs. Adding more milk continue to whisk until all the milk has been add. Transfer the mixture back into the pan and place on the stove over low-medium heat, stir constantly until thickened. Remove from heat and stain through a mesh sieve to remove any cooked egg. Place the bowl on an ice bath to cool, about 20-30 minutes. Once the custard is cool add the yogurt and whisk together. Place the yogurt mixture in an ice cream maker and allow to mix for about 25-30 minutes. Remove from the tub and store in a freezer safe container for at least 2 hours before serving. If the frozen yogurt becomes too hard to serve leave at room temperature for 10-15 minutes before serving. Serve with orange slices, pistachios, honey, or any desired topping. « Older Post Cheese Rind Soup	» Newer Post Avocado For Breakfast? Hey guys we don’t have Elk in Alaska! Moose, caribou and some deer but those are in South East for the most part. I know you were making a game vs store meat comparison, you just caught my eye with the reference to whackadoodle Palin. Thanks for the note. We love moose and deer, but haven’t had the privilege of eating caribou. Raspberry and Afognak Islands have lots of elk. 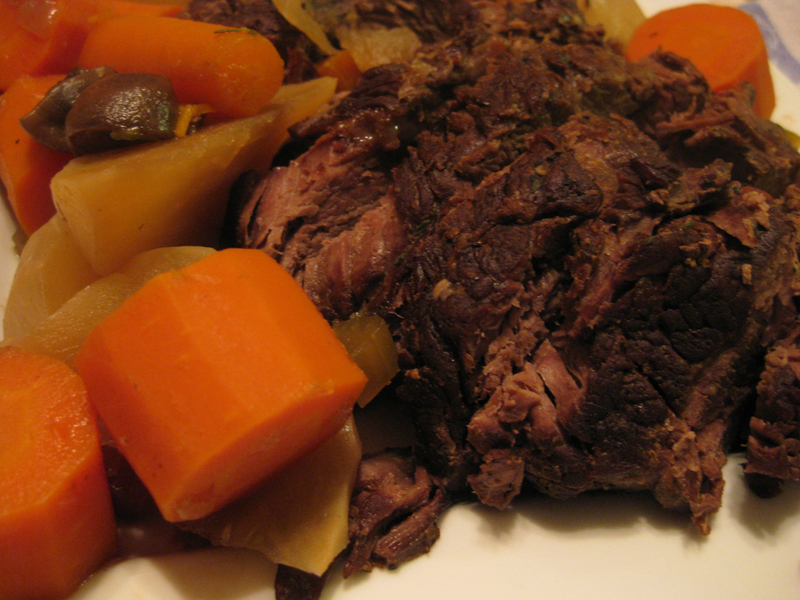 The elk pot roast recipe was outstanding! Thank you! Thank you! There will be more wild game recipes in our future, so stay tuned.